Bead, glass, olivine green AB, 8mm faceted bicone. Sold per 7-inch strand. Bead, glass, assorted colors AB, 8mm faceted bicone. Sold per pkg of ten 13-inch strands. 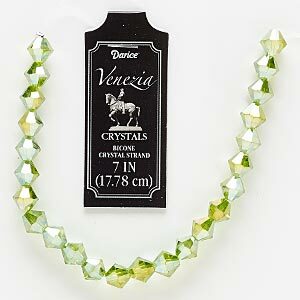 Bead, glass, frosted green, 3-4mm faceted bicone. Sold per 12-inch strand. Bead, glass, olive, 4-5mm faceted bicone. Sold per 12-inch strand. Bead, glass, green, 3-5mm faceted bicone. Sold per 12-inch strand.